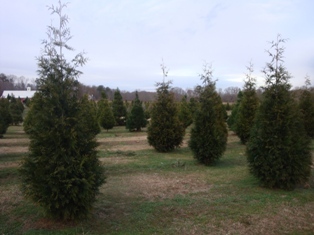 A Trip to a Typical Christmas Tree Farm: What to expect! 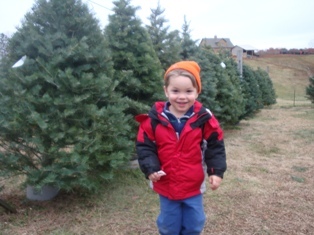 If you've never been to a Christmas tree farm, you might wonder what to expect, how to dress, how long will it take, what is there to do, what features to look for, etc. This page and the photos below should help answer those questions. For more specific tips, see this page. 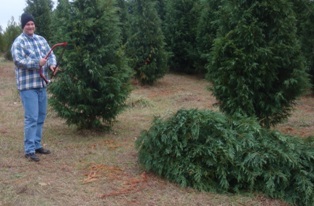 Of course, there is tremendous variability in Christmas tree farms. Some are almost like a mini-Six Flags amusement park, with train rides, hay wagons, food, music, events and more. Others are like a scene from "My Name is Earl". I suppose I risk the wrath of the latter group, but since they probably can't read, I'm safe. 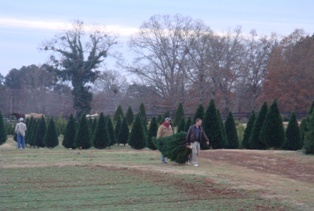 Some farm are little more than a plot of land, upon which Bubba has planted some pines, firs, or cypress trees. But before you dismiss this type, they really are ideal for folks who just what the freshest tree at the best price. You're not paying for anything other than the cost of raising the tree and his profit margin. Of course, folks like me, with small children, will probably prefer a tree farm that has something more to entertain the kids and make it a really memorable experience. 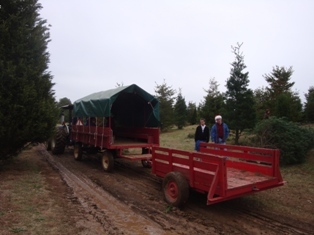 Here's a typical trip to a Christmas tree farm! 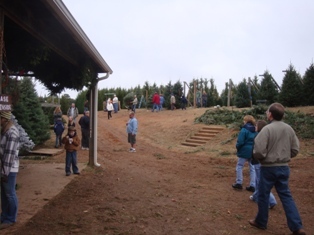 Arriving at the tree farm, you try to figure out where to start. There are people heading out to the fields, people returning, people milling about. If you read their listing and you know what you wants to do first, just ask someone where it is! I'd suggest you check the schedules. 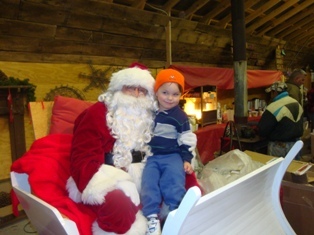 Often the farms have special events on the weekends, such as Santa visits (Santa's Grotto) entertainment, music, hayrides, etc. If they have a limited schedule or availability, you may want to do those first. 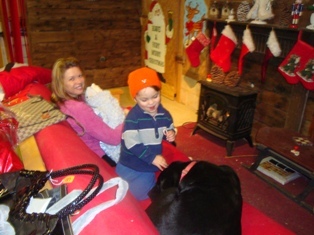 Santa can be popular, so when we saw a short line, we headed for his lap! Santa gave him a candy cane, which made Santa and instant hit! Next we saw the hayrides! There was a horse-drawn wagon, and also a tractor pulled wagon. 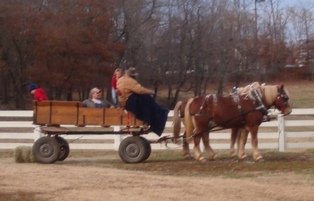 The horse-pull ride went around the farm. 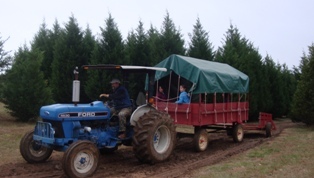 The tractor-pulled wagon took people out to the fields. If it has rained recently, the fields may be muddy, so wear books or old trainers! We did both the hayride and then took the wagon out to the fields! It didn't take my son long to find trees he like. The bigger, the better , apparently. Remember, that not all types of trees may grown in your area. If you have you heart set on a specific type of tree, such as fragrant fir, but only pines grow well in your area, you may want to simple walk around the growing trees, and then select a precut fir that was brought in. You should first take a look at our tree selection guide and then the tree variety guide. 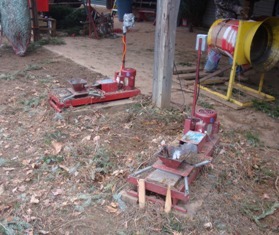 If you find a tree you like, you can cut it down with the bow saw. Most farms provide these free. And most farms will cut the tree down for you, usually at no additional cost, if you'd rather not play lumberjack for a day! This guy was obviously proud of his tree-felling prowess! Of course, you could just put it on the trailer and ride the wagon or hayride back! 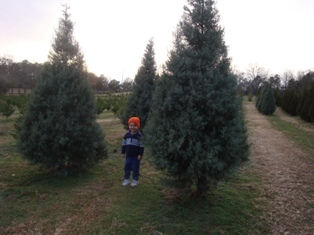 Christopher decided to check out the pre-cut (also referred to as "pre-harvested" or "fresh-cut" trees, too). Notice, they are standing in buckets of water! You don't want a tree that has been drying out! Then it's time to go inside and warm up by the fire! 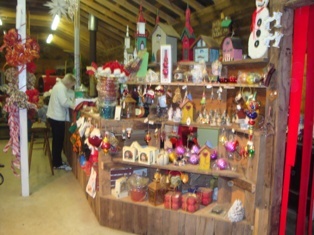 And check out the gift shop! Maybe have some hot apple cider, hot chocolate or coffee. 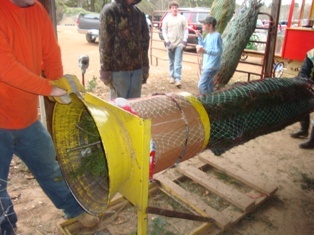 Meanwhile, the farm hands can shake the loose needles off your tree with a mechanical shaker..
.. and then bale it for your ride home. 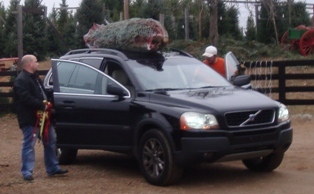 They'll usually even help to tie the tree to the roof of your car. We brought 8 long bungee cords instead. The works great on the roof of an SUV or a car. Truck drivers just put the tree in the back. Then we we off, back to home to set it up and decorate!